A global leader since 1954 in developing, manufacturing and marketing print finishing systems. Müller Martini objective is to meet our customers’ high demands by offering them innovative products and services in line with market requirements. Their systems are developed and manufactured in ultramodern production facilities in Switzerland, Germany, and the USA. 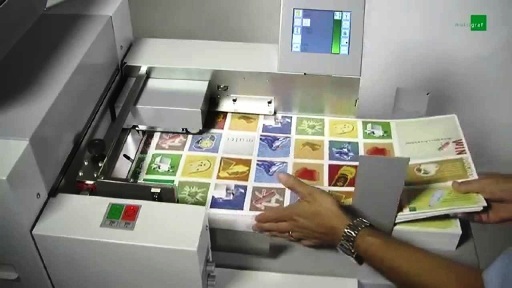 As the cost and time pressures in the printing industry continue to grow, there is also a demand for the quality of the end products to improve and the diversity of the products to be expanded. Finding the right answer requires extensive know-how of the processes of manufacturing printed products as well as technical competence when it comes to designing solutions. These are the strengths of Müller Martini. With flexible, cost-effective and fully-integrated first-class technology along with services portfolio, MMServices, Müller Martini customers can successfully meet the challenges of today and tomorrow. Müller Martini’s extensive product and service offering ranges from variable-size web-offset printing presses, saddle stitchers, perfect binders, hardcover systems, and newspaper mailroom systems to state-of-the-art technology for manufacturing digitally printed products in saddle stitching, perfect binding or hardcover production. With Müller Martini, you can rely on our over 60 years of quality, experience and expertise for innovative solutions in the graphic design industry. A worldwide leading Swiss manufacturer since 40 years in gluing technology systems for packaging, converting, graphics, hygienic, textile, woodworking, construction, automotive and various other industries. Robatech precise and efficient systems support customers to manufacture their products more economically. International activities are coordinated from headquarter in Muri, Switzerland, with nearly 150 dedicated and highly trained professionals in the areas of development, procurement, manufacturing, marketing, sales, service and administration. Robatech is a global, private company specializing in innovative, high–quality adhesive application equipment. In over 60 countries, experts advise clients on all matters relating to adhesive application, with quick and comprehensive support. Spare parts are available locally. The parts are quickly and easily replaced due to high modularity and the ability to re–use parts in many devices. All Robatech products are designed sustainably. They conserve energy and resources, and have a long life span. Operators appreciate the user friendly interface and advanced mechanisms that protect them whilst using the devices. Robatech products make your production processes more efficient and safer. 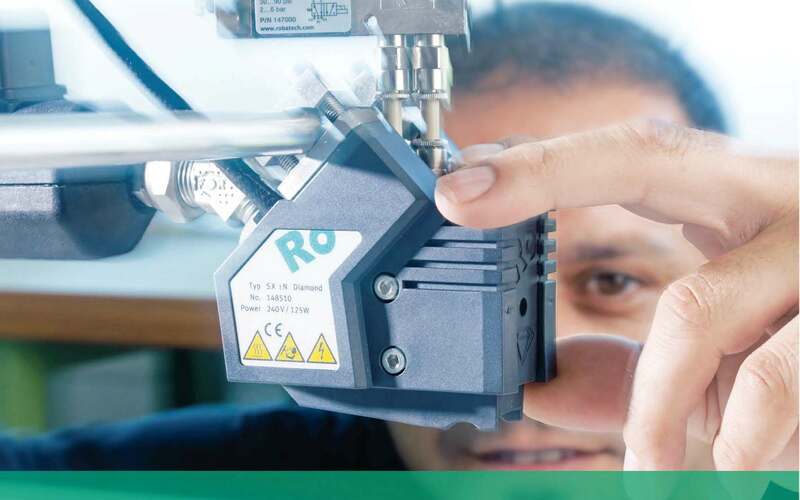 Robatech is your partner for environmentally and user–friendly application of adhesives. Since 1938 of experience in waste management systems, Hunkeler is a leading Swiss supplier of compactors, shredders, and customizable systems, to ensure waste in paper, cardboard and poly wraps processes is efficiently disposed of. By using compact units or complete systems specific to customers’ needs, an increase production efficiency is assured. Hunkeler realize solutions for the disposal logistic for recyclables like paper, cardboard, foils, PET, wood, waste, etc. to guarantee an efficient management of the waste. From compact solutions directly at the collection point to integrated system solutions to support the production process. With an impressive references list from successful installations around the world, in various fields such as security printers and national banks, recycling, pharma, metal, beverage, construction, chemical, commercial & newspaper printing, and packing industries, a solution for your project is available; from consulting, through planning, and final setting in operation, plus support, is only one stop away at Hunkeler. With more than 12.000 installations worldwide, from a single stacker to a complete fully automatic post press system, RIMA-SYSTEM is a leading manufacturer for finishing solutions behind conventional and digital web presses. Integrating the vertical log stacking technology from CIVIEMME-SYSTEM, the group offers the most complete machine portfolio for In-Line post press worldwide. The product range includes Conveying Systems, Rotary Knife Trimmers, Compensating Stackers, Log Stackers, Lift Collators and Palletizers. As a customer-oriented company RIMA-SYSTEM develops turnkey solutions that set it apart in the marketplace by striking a balance between the technically possible and the economically sensible. Printing plants worldwide value RIMA-SYSTEM as a dedicated project partner, competently and reliably designing post press systems and delivering them on time. Customers benefit from perfect finishing quality as well as long term knowledge in integrating machines into the production chain. Comprehensive after-sales service and the global dealer network ensure the extensive support of all customers – globally and 24 hours a day. Founded in 1955 as a private Swiss-based company, Strapex is today well represented in the market with own sales units and distributors around the world. Strapex serves the market with system solutions and services for securing goods for various industries. It offers a complete range of products, from strapping and stretch wrapping machines and tools to consumables and services. Latest technology in equipment combined with highest quality standards [EN-ISO 9001] and half a century of experience will grant you maximum availability and security. Strapex offers you tailor-made solutions for your individual application. Strapex serves the market with system solutions and services for product securing during transportation, for production, trade, and logistics. Our strapping applications cover product securing during transportation, bundled products and shipping boxes, printed matter, protection (pilferage), to support the supply chains of various industries. The motto “We Create New Solutions” is heavily backed by Eurofold concept machines at Multigraf AG company in Muri, Switzerland. Thanks to the great variety of machines in the Print-Finishing field many possibilities for post-print processing is now flexible and cost effective; be it for automatic envelope feeding, digital or commercially printed products for folding, cutting, creasing, or perforating. High speed solutions for feeding and stacking sheets are available. Also, in designing the Eurofold folding machines, the idea of “modular” is being further advanced. All models can be supplied with standard, manual folding plates and with simple basic equipment. If the requirements of the user change, the machines can be upgraded to the new features at any time. Multigraf, a successful Swiss supplier since 30 years, of high quality finishing machines, for your commercial and digitally printed products industry. Since more than 60 years, Schober was founded in Stuttgart, Germany, specializes in the development, design and manufacturing of rotary tools, modules and specialty machines widely used in film, foil, packaging, non-wovens and paper converting industries. These technically superior equipment are sold in more than 100 countries worldwide. Reasons which speak for Schobertechnologies are innovative products due to in-house Research and Development departments, Quality Assurance of all product, ISO 9001:2008 certification, Expert advise and consultation regarding integration of high performance modules and tools into new and existing production machines, and an extensive Worldwide after-sales-service. With Schober, quality products ensure a high level of production uptime and effectively reduce production costs. In the year 1982, Solema started manufacturing conveyor systems designed for the printing and post-press industries, including conveyors, stackers, feeders, boxing machines and palletizers. All these units have been successfully combined to create hundreds of customized lines over the years, earning a reputation for Solema, of cost saving and self paying systems, with increasing reliability, productivity, and safety. Recently in 2013 Solema Italy has expanded further and acquired Roda machinery for cutting pads and assemble partitions in different models and with different automation levels. The Roda systems have now been integrated with Solema products, which are all studied and designed and customized from internal R&D department. All main parts are build and produced inhouse at Solema through Numeric Controlled tooling machines of the latest generation. The electrical devices, as well as the Software, are developed from by inhouse skilled electric and software engineers. Every machine or complete line is fully tested before being shipped to the end user. Solema are distinguish by the ability to develop customized solutions that, thanks to the wide product portfolio available, can be realized by their machines, which are now a market standard. For more than 80 years, the W. H. Leary Company has made a commitment to engineering and manufacturing quality assurance, glue application, and mechanical solutions for the packaging industry. Their expertise in integration comes from a comprehensive understanding of sensors, controls, micro-processing, machining, and high-speed multi-tasking systems. Located in Chicago, IL, U.S.A. , Leary are dedicated to being a leader in manufacturing in-process controlling, monitoring, extrusion and data acquisition systems for the packaging industry. As an engineering company, they are continually developing new solutions which help our packaging partners produce products which exceed their customers’ expectations and improve plant performance. 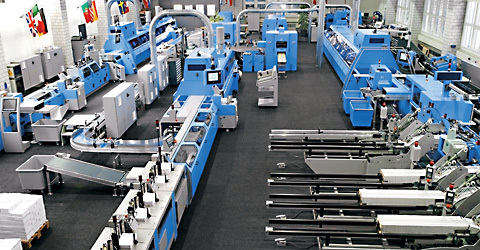 Packaging automation demands are increasing, which makes it necessary to rely on innovative and dependable equipment. Whether your business is part of the converting or fulfillment industry, W. H. Leary has a solution that will enable you to deliver a “100% fit-for-use” product to your customer. Hörauf was founded in 1938 near Stuttgart, Germany. Ever since, Hörauf has been designing and building high-quality machinery for the paper processing industry. Today, the company is focused on high-end equipment for the graphic and packaging industries. Hörauf equipment sets the industry’s standards for durability, reliability and robustness. A world-wide leader in design and manufacturing of hard covers for book binding and folder cases for stationeries. Hörauf also manufactures paper cup machinery, and is a world-wide synonym for outstanding quality. Cold cups, insulated hot cups, paper containers, and CALYX cups, are a few of their specialization. Copyright © 2010 Yousef Abdalla ALSanad Trading Establishment.